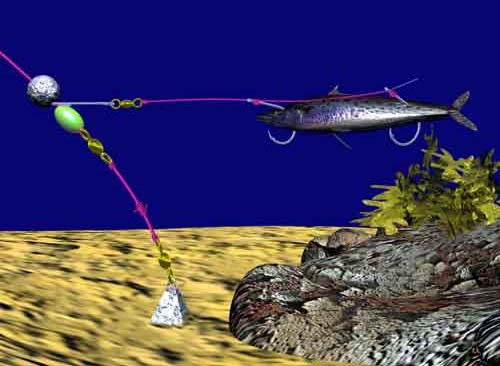 The Two Hook Pilchard Rig is a pre-tied rig manufactured by Paul's Fishing Kites. Utilizing the Target Hooks, we have designed this rig with an appendaged hook on the end of a one metre trace with a second recurve hook of the same size, snelled further up the trace. This system is much better than using treble fishing hooks which are often difficult and far more dangerous to remove. The Two Hook Pilchard Rig is available in the two most popular hook sizes for catching snapper, 4/0 and 5/0. Your destination and target species will determine which rig is best. The size of the bait you plan to use is also a factor when deciding on the correct rig. If you are using smaller baits, or targeting school fish then the 4/0 two hook pilchard rig is recommended and each hook should be baited with a long strip bait. For larger fish and bigger baits, such as pilchards or whole squid, the 5/0 rig is perfect. I have fished this rig at the Mokihinaus and in the Waitemata Harbour. I have found the two hooks through the pilchard bait is more and lasts a lot longer than a bait with a single hook. Being able to use a combination of squid and pilchards on the same rig is also an advantage, particularly when fishing for snapper. Fishing in the Waitemata usually means catching many undersized fish before hooking into the bigger ones. The Target Hooks on this rig really deters small fish so your bait spends more time in the water- more chance of a bigger fish taking it. On one charter trip my partner and I managed to catch enough snapper to fill a chilly bin while the rest of the crew caught less than ten fish between them. As the sun went down I reverted to using whole koheru for bait. I cut the backbone out to make a butterfly bait and hooked the two hook pilchard rig through the bait. It was very successful and the only reason we stopped catching fish was the charter was over and we had to return to port. If using a whole fish bait the head of the baitfish should be nearest the Target Hook with the appendage, opposite the way Paul has drawn it in the diagram above. Big fish usually like to swallow their smaller prey headfirst. Rigging the bait this way also makes the bait move more naturally in the water, thus making it more appealing to a hungry fish. I like to have my rigs fitted with snap clips with swivels on the end of the traces so if the trace gets tangled or you catch a good fish it is simply a matter of unclipping the trace and clipping another one on. Having the next trace already baited and ready to go over the side once the original trace is unclipped means less downtime. As soon as your next bait is in the water you have the opportunity to deal with the fish you have already landed. Prepare your gear at home before you hit the water because you can get more productive fishing time. I usually tie the snap clips onto the traces and place them individually in small zip lock plastic bags. Doing this means you know exactly how many rigs you have available and what else is required. The anticipation of what you might catch while knowing all your gear is organized is one of the best feelings you can get and part of what fishing is all about for me. With a maximum of 25 hooks per longline permitted each pilchard rig is counted as two hooks. If you are using these rigs on a longline a maximum of 12 traces can be used at any one time.